Security upgrades underway at U.S. Air Force bases in Europe indicate that nuclear weapons deployed in Europe have been stored under unsafe conditions for more than two decades. The new security perimeter under construction surrounds the so-called “NATO area” with 21 aircraft shelters (the remaining four vaults might be in shelters inside the Cold War alert area that is no longer used for nuclear operations). The security perimeter is a 4,200-meter (2,600-mile) double-fenced with lighting, cameras, intrusion detection, and a vehicle patrol-road running between the two fences. There are five or six access points including three for aircraft. Construction is done by Kuanta Construction for the Aselsan Cooperation under a contract with the Turkish Ministry of Defense. A major nuclear weapons security upgrade is underway at the U.S. Air Force base at Incirlik in Turkey. Click on image to view full size. The nuclear role of Incirlik is unique in NATO’s nuclear posture in that it is the only base in Europe with nuclear weapons that doesn’t have nuclear-capable fighter-bombers permanently present. Even though the Turkish government recently has allowed the U.S. Air Force to fly strikes from Incirlik against targets in Syria, the Turks have declined U.S. requests to permanently base a fighter wing at the base. As such, there is no designated nuclear wing with squadrons of aircraft intended to employ the nuclear bombs stored at Incirlik; in a war, aircraft would have to fly in from wings at other bases to pick up and deliver the weapons. A nuclear security upgrade is also underway at the U.S. Air Force base near Aviano in northern Italy. Unlike Incirlik, that does not have nuclear-capable aircraft permanently based, Aviano Air Base is home to the 31st Fighter Wing with its two squadrons of nuclear-capable F-16C/Ds: the 510th “Buzzards” Fighter Squadron and the 555th “Triple Nickel” Fighter Squadron. These squadrons have been very busy as part of NATO’s recent response to Russia’s invasion of Ukraine, and some of Aviano’s F-16s are currently operating from Incirlik as part of strike operations in Syria. A nuclear security upgrade appears to have been nearly completed at the U.S. Air Base at Aviano in Italy. Click on image to view full size. A total of 18 underground nuclear weapons storage vaults were installed in as many protective aircraft shelters at Aviano in 1996 for a maximum total base storage capacity of 72 nuclear bombs. Only 12 of those shelters are inside the new security perimeter under construction at the base. 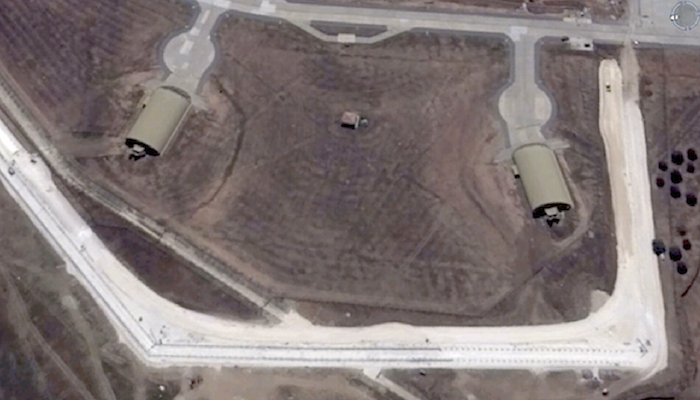 Assuming nuclear weapons will only be stored in vaults inside the new security perimeter in the future, this indicates that the nuclear mission at Aviano may have been reduced. In 2000, shortly after the original 18 vaults were completed, Aviano stored 50 nuclear bombs, or an average of 2-3 in each vault. The 12 shelters inside the new perimeter (one of which is of a smaller design) would only be able to hold a maximum of 48 weapons if loaded to capacity. If each vault has only 2-3 weapons, it would imply only 25-35 weapons remain at the base. Publicly available information about how much money NATO spends on security upgrades to protect the deployment in Europe is sketchy and incomplete. But U.S. officials have provided some data over the past few years. In November 2011, three years after the U.S. Air Force Ribbon Review Review in 2008 concluded that “most” nuclear weapons storage sites in Europe did not meet U.S. Department of Defense security standards, James Miller, then Principal Deputy Under Secretary of Defense for Policy, informed Congress that NATO would spend $63.4 million in 2011-2012 on security upgrades for munitions storage sites and another $67 million in 2013-2014. In March 2014, as part of the Fiscal Year 2015 budget request, the U.S. Department of Defense stated that NATO since 2000 had invested over $80 million in infrastructure improvements required to store nuclear weapons within secure facilities in storage sites in Belgium, Germany, Italy, the Netherlands, and Turkey. Another $154 million was planned for these sites on security improvements to meet with stringent new U.S. standards. In addition to the security upgrades underway at Incirlik and Aviano, upgrades of nuclear-related facilities are also underway or planned at national host bases that store U.S. nuclear weapons. This includes a new WS3 vault support facility and a MUNSS (Munitions Support Squadron) Operations Center-Command Post at Kleine Brogel AB in Belgium, and a WS3 vault support facility at Ghedi AB in Italy. When I obtained a copy of the U.S. Air Force Blue Ribbon Review report in 2008 under the U.S. Freedom of Information Act and made it available on the FAS Strategic Security Blog, it’s most central finding – that “most” U.S. nuclear weapons storage sites in Europe did not meet U.S. security requirements – was dismissed by government officials in Europe and the United States. During a debate in the Dutch Parliament, then Defense Minister Eimert van Middelkoop dismissed the findings saying “safety and security at Volkel are in good order.” A member of the U.S. Congressional delegation that was sent to Europe to investigate told me security problems were minor and could be fixed by routine management, a view echoed in conversations with other officials since then. Yet seven years and more than $170 million later, construction of improved security perimeters at Incirlik AB and Aviano AB suggest that security of nuclear weapons storage vaults in Europe has been inadequate for the past two and a half decades and that official European and U.S. confidence was misguided (as they were reminded by European peace activists in 2010). And the security upgrades do raise a pertinent question: since NATO now has decided that it is necessary after all to enhance security perimeters around underground vaults with nuclear weapons at the two U.S. bases at Incirlik and Aviano, doesn’t that mean that security at the four European national bases that currently store nuclear weapons (Büchel, Ghedi, Kleine Brogel, and Volkel) is inadequate? Ghedi reportedly was recently eyed by suspected terrorists arrested by the Italian police. Storing nuclear weapons in Turkey, an unstable nation in a highly insecure Mid-East region, is an intolerable policy that should be urgently corrected. From what I have seen and heard, U.S. nuclear security isn’t all that great either. The fact that upgrades are happening could mean that the bases haven’t been adequately protected —- but it could also mean that the threat has changed and the upgrades are being made in response to a change in the threat environment. If that is the case then the weapons were not inadequately protected in the past. Given the rise of Islamic fundamentalism and unrest in the region – particularly in Turkey – I am more inclined to believe these upgrades are due to changes in the threat the bases face more than the bases being unsafe for the last 20 years. Your claim is unfortunately not logical. If the changes are made in response to new threats and not because the security was permanently inadequate, when we point out instability in the region as likely source, could you please to explain what is the new source of instability and threat model in Italy that forces almost identical upgrades to Incirlik and Aviano? Do we have organised insurgents and neigboring islamic state some 150km from Aviano? Or just the reason for upgrade was a threat that was persistent and inherent to design of major US nuclear storage facilities in Europe. I agree with Keith. Every time we upgrade something we shouldn’t necessarily consider it a complete condemnation of the system of the past. Security was sufficient enough to protect our assets there until now and we have a new climate there and a new mission as well so it is time for enhancements. We have to see to that the US withdraw their nuclear bombs from Europé. The US is the only country deploying nuclear weapons outside their borders aimed at Russia. We also should protest the violating of ABM Treaty when the Clinton and then the Bush administation deployed the Globus ll radar in Vardö Close to Russia. It was a gross violation of the Treaty. In ’66 and ’67 I was an Air Policeman at Incirlik. I dreaded the dayshift post of the nuclear cantonment area because I was always got sunburned from walking around it for 8 hours. In the cold war alert area in the photo there were 4 F100s armed with nuclear weapons. We all wanted that post because we got to eat the same noon meal that the pilots were having. This was the base F. Gary Powers flew his U2 from. Best thing about this assignment was the ‘compound’ downtown. We knew all the words to Petula Clark’s hit, Downtown. During the Cuban Missile Crisis in Oct ’62, JFK agreed to close the US nuclear bomber base [or missile base] in Turkey. RFK told Gromyko that JFK would do so in a few months [the base was already planned for closure]. The US has since opened more nuclear force bases in Turkey: did the US RENEGE on its 1962 promise to Russia? Encircling Russia is a very significant and clear provocation. No, US did not renege its 1962 promise to Russia. The Thor missiles were withdrawn (promise was about missiles, not bases). As Cold War continued, both the Soviet Union and United States added nuclear-capable bases in allied countries in Europe. By the mid-1980s, the US had five nuclear-armed air bases in Turkey with nearly 490 nuclear bombs. One decade later, by the mid-1990s, nukes had been removed from all but Incirlik. Today about 50 weapons remain at Incirlik.